We spent over 41 hours researching and testing 10 different brands of espresso machines and found that performance, ease of use, and ease of cleaning were most important. The De’Longhi Dedica Espresso Machine scored high marks in all areas and is our top pick. It is the perfect machine to provide you and your friends and family with café-quality espresso drinks right in your own home. 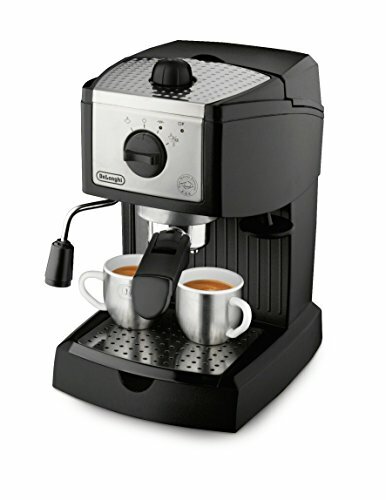 The pump espresso machine enables you to create a rich and simple espresso shots or you can opt for cappuccinos instead. It takes up minimal counter space and is perfect for small kitchens and apartments or dorm rooms. In the last decade or two, espresso consumption has dramatically increased in the United States. In most major cities across the country, you can’t walk a couple of blocks without finding a cafe or espresso cart with eager customers lined up for their latte, cappuccino, or straight shot of espresso. You’ll also find espresso in grocery stores, bookstores, gas stations, and even laundromats and movie theaters. Increasing in popularity are drive-through espresso shacks in parking lots, and even espresso carts found on the sidewalk or street corner. Also increasing in popularity are at-home espresso machines, giving people the convenience of being able to make perfectly-prepared coffee drinks in the comfort of their own homes. Smaller than commercial machines, home espresso machines work the same way as their larger counterparts, but with some key differences. There are now countless machines on the market that fit perfectly on any countertop, and allow consumers to make their perfect drink with ease, while also saving them money in the long run. In fact, considering the high cost of espresso drinks in fancy cafes, an at-home espresso machine will in essence pay for itself over time. This guide will help you to find the perfect espresso machine for your home, while also giving key tips on how to get the most out of your machine. Once you find the right machine for you, then it’s time to do some experimenting to master the art of making the perfect coffee drink. Whether you’re a fan of lattes, mochas, or macchiatos, you’ll find that making these drinks at home is easier than you ever imagined, and saves you from having to wait in line at your local cafe each morning. In your experimentation you’ll find that you need to master the control of certain key elements, such as the temperature of the water, the pressure setting, the fineness of the ground coffee, and how tightly the coffee is packed. The right machine will help you to control these variables so that you don’t have to think about it too much. In fact, the best machines do a lot of this work for you. If you desire cafe-quality espresso drinks in the comfort of your own home, then the De’Longhi is designed to do that with ease and precision. This pump espresso machine allows you to either create rich and simple shots of espresso to be consumed ‘straight-up’, or rich and foamy cappuccinos with the use of the attached steam nozzle. The device features a slim and sleek design that complements any kitchen decor, while only taking-up a minimal 6 inches of counter space. 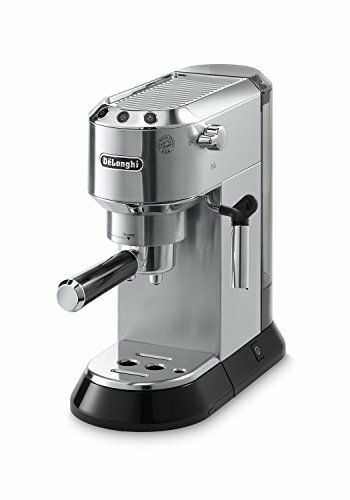 In fact, the De’Longhi is a fantastic option for those who have a very small kitchen or apartment, but still want all the benefits of a high quality espresso machine at their fingertips. Thanks to the thermoblock technology, you can heat water to the optimal temperature in only 40 seconds. 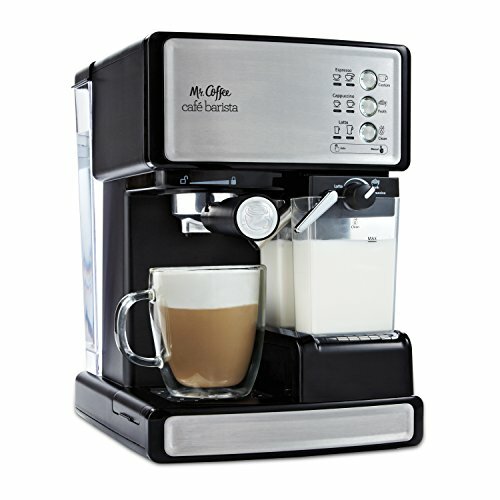 We all know that when you need that perfect coffee drink, you need it now, and that’s why this machine is so genius. There’s no waiting while the machine heats itself up, and once turned on, you can be on your way to the perfect cup in no time. Thanks to the self-priming system that is installed, the machine is always ready for use, further speeding-up the time it takes to make your drink. With the flow stop feature, you can choose between either a single or double shot of espresso. This makes it even easier to customize your drink on the spot, and choose what intensity you’re looking for. The three-in-one filter is what makes it so easy to switch between single, double, or easy-serving espresso pods. There’s also a handy tamper included to help you to compress espresso grounds. The right level of compression is what gives you the maximum flavor in your coffee drink. Lastly, the De’Longhi provides you with an illuminated control panel that is easy to use and quite intuitive, making it easier than ever to make the perfect espresso drink that you crave. If you’re a cappuccino fan, then you’ll love the smart cappuccino frothing system that guides you to make just the right level of thick foam. The built-in steam regulator also helps to keep the temperature at a safe level. Mr. Coffee is a trusted brand when it comes to all things espresso, and this Cafe Barista machine will make you feel like you have a finely-trained barista living in your home! The machine makes it possible to create professional-quality espresso drinks in your own kitchen, and without having years of experience to back it up. The machine is designed to make a number of gourmet-style espresso drinks in no time. Make your favorite rich concoctions, creamy cappuccinos, and sweet lattes, as well as more creative drinks like cafe mochas, toffee lattes, espresso martinis, and even caramel cappuccinos. With this machine you’ll receive a recipe guide that makes it easy to create the most decadent drinks, with 20 delicious and delectable ideas that you never imagined possible to create in your own kitchen. The controls on this machine are incredibly user-friendly, so there’s no reason to be intimidated if this is the first espresso machine you’ve ever owned. Even a novice can master using the Cafe Barista in no time. The one-touch control panel will first have you select a single or double shot for your beverage, and smart indicator lights will highlight what happens to be the current selection. With this machine you get 15 bars of pressure for the most delicious results in a flash, and the automatic milk frother transforms milk into a light and creamy foam that can then be drizzled with chocolate, sprinkled with nutmeg and cinnamon, and eventually turned into the perfect milk mustache. Lastly, this machine has some added bonuses such as froth, custom, and clean buttons, an easy to remove drip tray, and convenient side-mounted on/off switch. And nearly every part of this espresso maker is dishwasher safe, making cleaning easier than ever before. You’re going to be amazed at how much time and money you’re going to save with this smart and stylish machine. Arguably, De’Longhi makes some of the best at-home espresso machines on the market, and the EC155 is no exception. This pump espresso and cappuccino maker allows you to choose between brewing ground espresso or using E.S.E pods thanks to the patented dual filter holder. Get the perfect cup every time, and at just the right temperature with the two separate thermostats that are precise and easy to read. The swivel jetfrother is incredibly easy to use and provides some of the most impressive crema you can imagine. You can also enjoy extra features like the self-priming operation which helps to eliminate start-up preparation, a removable water tank and drip tray, as well as a stainless steel boiler that is built for durability and longevity. Another thing that really makes this espresso machine stand out is the dual function filter holder. With the latest popularity of espresso pods, it’s great that this machine allows you to choose between the traditional method and the latest trend. Depending upon how much time you have, you can grind your espresso or just throw in a pod when you’re on the go and have less time to compress your coffee. This versatility is great, and the self-priming operation makes the whole process even faster, since there’s no waiting around for your espresso maker to heat to the proper temperature. Lastly, the EC155 is incredibly easy to clean. We all know how important that is, because an espresso machine can seem like the most daunting appliance to clean! And there’s nothing worse than waking in the morning to a soiled espresso machine. With all these features combined, this is one of the best performing espresso machines that you can find. There’s a growing trend towards making espresso drinks in the comfort of one’s home. With the increased popularity of cappuccinos and lattes in the United States, people are looking for a more convenient and cost effective way to get the perfect coffee drink each morning. Purchasing an espresso machine for your home is an amazing way to save time and money, but to maximize the pleasure and benefits of owning your own machine, you want to find something that creates professional results without all the guess-work. That’s why it’s essential to find a device that is intuitive and easy to use, while also being easy to clean and maintain. The best-functioning espresso machines are not necessarily the cheapest, but that doesn’t mean that you should have to break the bank to make the perfect foamy cappuccino in your own kitchen. Look for an espresso machine that is within your budget, but created by a brand name that you can trust. Finding a machine with a good warranty is also a fine idea for creating confidence in your purchase. A quality espresso machine should be treated like a kitchen investment piece, and that’s why it’s not a bad idea to spend a little more than you might on a coffee machine or other mundane kitchen appliance. What is a Espresso Machine? Some say that espresso is like the new moonshine, due to the increasing popularity of making it for yourself at home. But thanks to the advanced espresso machines on the market, making a fine cup of hot brew for yourself is not nearly as complicated as fermenting booze in a claw foot tub. Whether you’re an amateur or a connoisseur you’ll find it easy to make an espresso drink with one of these elegant and user-friendly machines that fits perfectly on your kitchen countertop. And you’ll feel good doing it, knowing that you’re not paying the top-dollar that is being charged for a cappuccino in a cafe. That being said, those who are new to the practice of pulling their own shots will find it intimidating to find the right equipment, because there are simply so many machines on the market these days. Some of these machines seem quite complicated, and some have price tags so high that even the most espresso-addicted individuals will gasp and have second thoughts. But be confident that the right espresso machine for you is out there somewhere, and it’s truly not hard to find when you know the basics about these devices. When you follow this guide to buying the right espresso machine, you’ll find that it’s not only stress-free but also fun to hunt down your dream machine. To begin, it’s best to have a little background information about this rich brew that you crave. Espresso coffee is a blend of different types of coffee bean from various different countries. The beans are finely roasted until they are incredibly dark and somewhat oily looking. After being roasted, espresso beans are ground very finely, and that’s where there’s the most distinction from regular coffee. Once the beans reach a consistency akin to powdered sugar, they’re ready to brew. The finer the espresso is ground the slower it takes for the water to pass through it, and that’s why there’s so much intense flavor. A good batch of espresso should take 25 seconds for all the water to pass through. Why Does Espresso Taste So Good? Coffee nerds agree that espresso is the finest tasting coffee in the world, and this is due to the high pressure of the extraction process which enhances the aroma and the body of the coffee. Because there are so many factors that go into the perfect espresso, such as perfect pressure, temperature, and timing, it is said that, “espresso is the finest drink because it is the harmonious combination of several elements controlled at a perfect level.”Not only is the quality of the coffee and brewing process superior, but there are so many fun and delicious renditions of this coffee that use the espresso as a base for steamed milk, sweetness, and flavor enhancements. Crema is that delicious, thick, foamy layer that sits atop the espresso liquid. This is not the foam that comes from milk, but rather the natural downy foam created by the coffee itself. This adds an intense softness and flavor to the espresso, and what makes the coffee so complex and interesting on the palate. Hardly just air, crema is actually a melding of air, gases, water and coffee that is a result of the pressurized extraction process. This adds a fine body and aroma to the espresso that you can never get from plain coffee. The most basic machines use pressure that comes from heating the water inside the vessel, and this pressure powers the brewing process. All you do is basically pack the coffee into a funnel-shaped piece of metal that has a tube that extends to the bottom of the reservoir. When you put a few ounces into the reservoir and screw on the top, you’re ready to start brewing. Heated water will build pressure inside the vessel, and the only way for it to escape is to come up the tube. This is a simple process, but not necessarily the easiest machine to use because often the temperature of the water can exceed what is the ideal brewing temperature. To avoid this problem, it’s best to find an espresso machine that regulates its own temperature, thus leaving less room for error. You’ll find that there are four main categories of espresso machine, and these include manual, semi auto, full auto, and super automatic. When you get a better sense of which one of these you’re looking for, you can greatly simplify your hunting process for the best machine. We will begin with the most labor-intensive machines, and work our way to the most intuitive and automatic. Manual machines have all the charm of an antique restored car from the 1900s, but many agree that they’re better to have as an homage to the history of espresso making, and less so for actually making a cappuccino. Yes, there are fewer buttons and bells and whistles on these machines, but what you’re losing is the ability to maintain constant water pressure, and users must push water through the coffee manually which can diminish the quality of the finished product. That’s why, even though these machines are charming and more affordable, they should really only be used by the most experienced baristas. Achilles Gaggia patented the semi-auto espresso machine in 1938, which introduced electric pumps into the devices. The benefit of this was that users could enjoy more even and hands-free water pressure, which resulted in a better shot of espresso. When operating a semi-auto you can turn the pump on and off, and all boiler temperature controls are automated. This is the most popular type of ‘traditional’espresso machine that you can find today, however there are still many modern advantages that are missing on this basic machine. A great deal of skill and practice is still required to use a semi-auto. Despite the difference in name, the fully-auto is quite similar to the semi-auto, except that they include an electronic nanny which regulates the amount of water that passes through the espresso during brewing. That is the only innovation on these machines that sets them apart from the semi-auto. Which brings us to the machines with all the bells and whistles that you crave: the super automatic. Many of these machines take care of a lot of the work for you, and also include built-in grinding features and other fun tools. “Cafe Crema”has come into popularity thanks to these amazing machines, as well as many other coffee creations and innovations. If you’re new to making espresso, and you want to make the most fun and creative drinks imaginable, then a super automatic espresso machine is what you’re looking for. Finding the right espresso machine for your home begins with asking yourself exactly what you want out of your machine. Begin by asking yourself what kinds of drinks you want to make. Are you planning on brewing straight espresso, cappuccinos, or both? Also, ask yourself how many people in the household will be using machine, and what volume of beverages you will be churning out. If you plan on making yourself a couple of lattes each weekend, then you’ll be looking for a much different machine than if you and your 4 children want to make cappuccinos every morning for the next 10 years of your lives. Some machines are much more geared towards sustained performance and durability than others. Investigate whether or not you’ll be able to use a direct plumb machine that connects right to your home’s water pipes. This adds a great deal of convenience, but you must first make sure that you’re capable of doing this in your home. Do not fear if you don’t have this capability, because you can simply buy a machine with a water reservoir that you fill manually. Also, determine what kind of power supply you have available in your home, as some machines require more than others. When it comes to spending cash on an espresso machine, what you’re really paying for are boilers. Most machines that are under $1,000 will use a single boiler with dual-use setups. What this means is that they use a single thermostat to control the water temperature, and therefore cannot brew espresso and steam milk simultaneously. A single boiler espresso machine is not the right choice if you want to make a beverage fast, and perform multiple functions at the same time. When you’re spending above $1,000 you’re probably getting a single boiler, heat exchanger machine. These feature a large boiler which maintains water temperature at around 240˚, and allows you to brew and steam milk simultaneously. These machines are more user friendly and allow you to make a beverage more quickly. Lastly, if you’re spending over $2,000, you’re definitely going to be getting a dual boiler, which features two separate boilers to brew and steam simultaneously. Please keep in mind that even though these machines are incredibly impressive, many North American 110V power outlets cannot handle the needs of this caliber of machine. For those living in Europe, owning this kind of machine is much more feasible. There are, however, many North American brands that are finding ways to work around this as we speak. Once you find the perfect espresso machine that fits right into your budget, it’s important to take care of it so that it will perform for years to come. One important factor is cleaning. You want to clean your espresso machine every day to avoid the build-up of residue on your machine. When residue does build-up you can get over-extraction and staleness which results in a burnt taste that you do not desire. Many machines on the market today will have a cleaning button that automatically performs a cleaning cycle to remove residue, which makes your life much easier. It’s also best to find a machine that has easily removable parts that you can wipe down, or even put in the dishwasher. All in all, taking proper care of your machine is essential to its wellbeing, and the flavor of your coffee. Knowledge is power, and one of the best ways to maintain your machine is to simply know about it. You want to pay attention to the details of your machine, such as the max pump pressure, and whether or not it’s self-priming. Also, pay attention to what type of boiler setup you have, and if there is a thermostat involved. Knowing these details will inform you as to how much personal effort you need to put into making your drink, and what you need to do to keep your machine at optimal performance level. Pay attention to the water tank, if there is one, and how you can best maintain it. Knowing these details is important to get the most out of your espresso machine. Grinding the beans is the first step in making great espresso, and if you mess that up, nothing that you do afterwards will fix it. That means that you need to invest in a high quality bean grinder and learn how to use it properly. This fundamental step in the process is not to be overlooked. Many espresso machines come with their own bean grinders these days, and if it’s a high quality machine, then it’s probably going to be an equally high quality grinder. Follow the instructions, and become a master at grinding to the optimum consistency. Once you find the perfect espresso machine, delving into the world of accessories is even more daunting. You will not believe how many things there are out there to enhance your espresso-brewing experience. That being said, many of these accessories are considered to be obsolete by seasoned espresso makers. Take for instance the crema enhancers. These attachments can actually damage a good cup of espresso, and not enhance it at all. Also be mindful that espresso machines with bar ratings, such as 15, 16, or 18 are not always completely accurate due to restrictors and overflow valves, so take that with a grain of salt. There are frothing aids out there, and they may seem helpful, but in the long run it isn’t too hard to get a handle on frothing, and with time this aid will seem obsolete. They can also reduce the natural sweetness of the milk froth because they continuously administer heat. Lastly, be weary of steam buttons that can be switched on and off, as these do not allow you the same leverage as steam knobs. With this knowledge under your belt, you’re ready to dive into the world of espresso machines, and find the one that’s just right for you. Do not fear enormous price tags because, after all, you are looking to purchase a machine that is ultra-specialized, precision made, and able to produce incredibly refined espresso that costs a fortune in most restaurants and cafes. The added convenience and luxury of being able to make these drinks in your own home is something that you can’t put a price tag on anyhow. It seems like a serious endeavor to purchase an espresso machine, but once it’s in your kitchen, you’ll be amazed by the impressive, delectable, and invigorating drinks that are right at your fingertips. And a final thought: don’t be afraid to take your time when looking for the right espresso machine for you. What you’re purchasing is an investment piece, and something that is sure to bring great pleasure to your home and daily life. Get to know the machines you’re interested in, learn about them, how they’re constructed, and how they work optimally. Fostering this knowledge and understanding will only enhance your enjoyment of purchasing a machine, and tasting the fruits of your labor.